When most people think of “2-in-1” shampoo and conditioner products, images of the old Pert Plus commercials come to mind. These combination products have generally had a more utilitarian reputation with a masculine following and the overall idea of “getting it over with.” Recently though, I noticed a few new 2-in-1 products with revamped packaging and appealing claims about moisturizing and protecting hair. The usual complaint about standard shampoo is that it strips curly hair, leaving it frizzy and difficult to manage. On the other hand, some people feel that sulfate-free cleansers do not give them the clean scalp feeling that they want. I wondered: could a shampoo-conditioner hybrid be the happy medium? I began my research online, quickly realizing that there are few high-end brands that offer 2-in-1 options. Head Organics 2-in-1 Shampoo & Conditioner appeared to be a good option of the natural variety. I decided to continue my search in the drugstore hair product aisle, looking for something that could get the job done at a budget friendly price. There were several low cost 2-in-1 options for children, as well as various male brands with scent varieties such as “Anarchy” (seriously! ), but I really wanted a modern feminine version! Hair care brands Aussie, Garnier, and Tresemme had a few 2-in-1 shampoo options, but it was clear that Pantene and Herbal Essences provided a wider selection. Pantene had 2-in-1 versions in several of their product lines, boasting benefits such as volumizing, shine enhancing, color protecting, and strengthening. 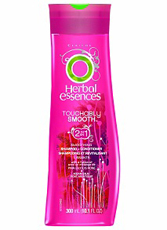 Herbal Essences had two choices, one being the “Touchably Smooth” humidity fighting option, and the other the “Hello Hydration” moisturizing version. I was assessing my choices when a brand new product caught my eye. 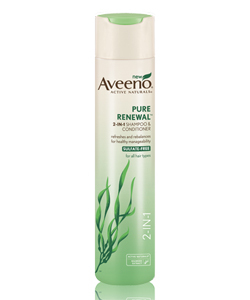 Aveeno Pure Renewal 2-in-1 Shampoo & Conditioner was exactly what I was hoping to find! I immediately noticed that it was sulfate-free, which seemed like an automatic plus. The packaging was modern without being cheesy or child-like, it was under $7.00, and it smelled great. It had much more natural ingredients than any of the other choices, and the package promised to rebalance hair and avoid over-stripping. I was sold! I have type 2b to 2c hair that can get extremely dried out from washing, so I normally only wash it once every three days. I decided that testing out the Aveeno 2-in-1 for three weeks would give me enough chances to use it and see results. I thought it was best to keep the rest of my routine constant. I typically use a leave-in conditioner combined with gel and add sea salt spray if I am needing to tighten my curls, reviving my hair as needed with my stand-by product, CURLS Quenched Curls 2nd Day Curl Refresher. The first time I used the 2-in-1, I had mixed feelings because my hair felt dry. I realized that I had completely cut out my usual conditioner and deep conditioner, so my hair was drier than usual anyway. From there on out, I continued to use the 2-in-1 but made sure to add conditioner on the ends or do a deep conditioning treatment as needed. My hair felt clean every time. Once I found the right balance with conditioner, I was very happy with the results. My hair seemed shiny and manageable without being stripped from shampoo or weighted down by a heavy cream cleanser. The Aveeno 2-in-1 really did deliver what I was looking for, providing the fresh and clean feeling of shampoo with the moisturizing benefits. I think that this 2-in-1 has definitely made it on my list of favorite products. However, I still think that it is important to deep condition often and continue using a leave-in conditioner with this product, especially for those with tighter and thicker textures. It is more of a shampoo replacement and a conditioner enhancer, rather than taking the place of your other conditioning regimens. Have you ever tried a 2-in-1 product? Let us know what you thought!